Land Rover history on display at the Dunsfold Collection Open Day 2006. 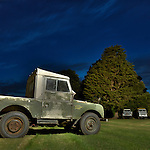 From each Dunsfold related image sale 1 Euro will go as a DONATION to the Dunsfold Collection to support the maintenance of this wonderful Land Rover collection. Please use the SEARCH function to see more images from this event.